Teddy Roosevelt had many great quotes. So many of his great quotes were dedicated or in reference (as was the above) to the National Parks system he helped create, including Grand Tetons National Park where he spent a lot of time. 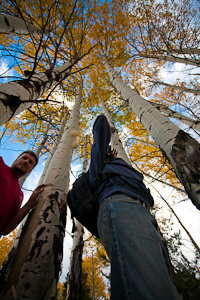 Nothing brings out the adventurous spirit in us more than a trip to a wild place like Grand Tetons National Park. Grand Tetons is easily one of America's most iconic. 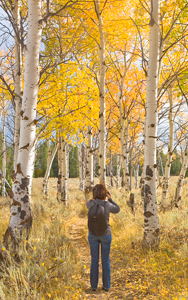 The towering granite peaks over the Snake River valley, images of bison and moose in the fields, and of course the wonderful colors of fall as gold and yellows dominate the aspen leaves. People travel from all over the world to this mountain landscape just to see it. 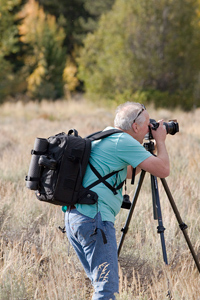 The problem occurs when people try to capture what they see on a camera and try to bring that back with them to show others. That's where we come in. 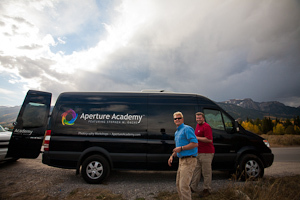 The Aperture Academy sent out its best and brightest to meet 16 eager photographers/adventurers and show them a weekend of fun and photography. Instructors Stephen Oachs, Brian Rueb, Scott Davis, and Scott Donschikowski met the students on a beautiful Friday night in Jackson Hole, Wyoming to enjoy a glass of wine and go over the schedule for the weekend, what to expect, and how to behave around the wildlife we could possibly encounter. The group came from far and wide and brought with them a varied range of experience and goals of what they wanted to focus on during the weekend. The one thing the whole gang had in common was enthusiasm! The enthusiasm dipped a bit when we told them they needed to be ready to roll out at 5:45am in the morning, but we promised it would be worth it. The first place the group went was the iconic Oxbow Bend, a slow, reflective turn in the Snake River that offers one of the best views of Mt. Moran in the entire valley. The mountains are surrounded by golden yellow aspen and cottonwood trees and the reflections are breathtaking. 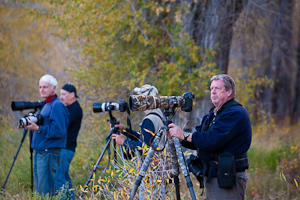 It's also one of the more popular viewing areas for wildlife in the park. Early mornings bull elk can be heard bugling and then seen crossing the river as they move their way from the safety of the valley back to the shelter of the tree line. Our group arrived and set up in the dark. Many were unaware of the seen that would unfold before them as the sun rose in the east and lit the scene up in shades of gold. 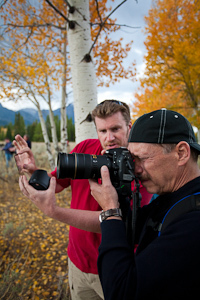 During our time there Stephen, Brian, and the Scott's worked with students on settings and helped them to compose images that would bring out the best of the scene. To bring out the best often means using polarizing filters to help bring out the reflections as well as graduated filters to help stop back the light from the top portion of the frame and create a more balanced exposure. 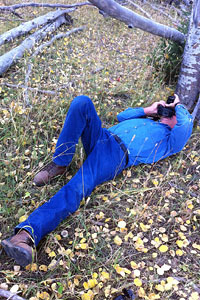 As the scene began to take shape the mountains lit up with shades of red, the golden warmth of light swathed the aspens, and we waited to see if an elk or moose would venture into the scene. Just when we thought the animals had eluded us the cry came out..."An ALLIGATOR!!!!!" There's so much wildlife in these necks of the woods that sometimes our students aren't always familiar of what kind of creature could be swimming near them in the early morning light. It turns out it was just a large beaver going about his morning routines. The ordeal put a great lighthearted feel to the morning and the rest of the shooting was tremendous. With the first icon in the bag it was time to set off in search of critters. 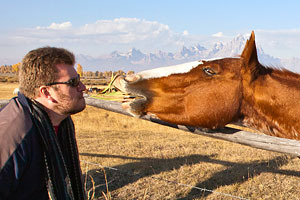 Grand Teton has the highest percentage of wildlife of any national park. Whether or not you can find it is the issue. 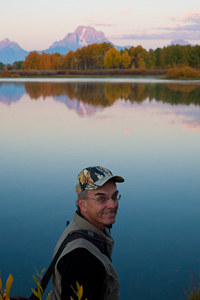 Scott Davis spent a lot of time in the park as a wildlife biologist and has tremendous knowledge of the park in terms of where the critters are likely to be and is able to put us in the areas that give us the best chance to find and photograph and animal. The morning drive didn't yield much in the way of wildlife, but the light and clouds were still nice so we took the opportunity to stop at the Snake River Overlook. This location was made famous by the late Ansel Adams, and offers a stunning view of the Teton Range and the curves of the Snake River. The class set up with the best angle, many climbing atop the wall to get a nice high perspective and really accentuate the curve of the river, which made for a nice leading compositional element in the image. 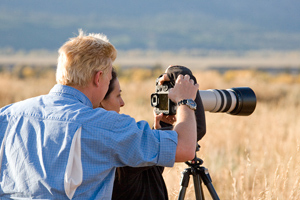 Many students come to us wanting to learn more about composition and how to frame a shot. This location provides a great curve to really demonstrate the importance of using curves to lead the eye into the frame. With the Snake River Overlook completed we moved on again in search of critters on Moose-Wilson road, a notorious hang out for moose and bear. We could see a lot of evidence in the foliage in terms of game trails and places where animals had moved from the higher tree lines down into the valley, but we couldn't find any creatures making the journey that would allow us to take photos of them. They were still taking their morning nap. We did find an Osprey in a nest that allowed our group to get fairly close and some of the class was able to really use their zoom lenses in order to get some nice images of this magnificent bird of pretty. While we loved photographing the bird, and waiting for him to take flight we still couldn't find any larger fauna to take pictures of. This was the perfect time for us to take a break as and catch up on some rest and eat lunch. The evening light was beginning to fade as we approached the Gros Ventre River area in search of moose. Within minutes of arrival we spotted a mother moose and bull calf in the river foliage. They're bizarre calls filled the air as they munched on the lush green willow shoots located on the rivers' edge. Our class quietly approached to safe distance and set up to shoot. Scott and Brian moved along the river looking for other moose to photograph. A bit down from the first moose another cow was laying along the shore gearing up for her nightly rest. The class was able to get some great animal in environment shots of these moose with the gold and reds of the fall colors behind them. 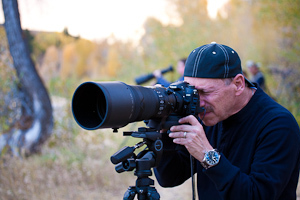 The instructors' stayed with the class to help them compose images, increase ISO to get faster shutter speeds, and make sure they could capture the best images possible of these massive members of the deer family. The group split into smaller factions each looking at a different moose. Wildlife is unpredictable and everyone wanted to be ready if the unexpected occurred…..which it did. The mother moose and calf had decided they'd had enough of being photographed and turned to head away from us and cross the river. We could hear them thrashing through the reeds, and into the river. No sooner had they left our sight and the sound of hooves moving towards us came thundering back. 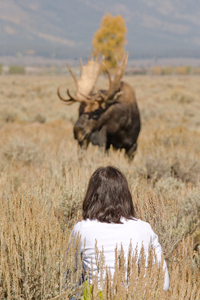 The moose came crashing out of the willows RIGHT towards our group, which scattered in impressive fashion and made haste back to a safer distance. Something had spooked the moose on the other side of the willows. We waited to see what it was, and low and behold a large bull moose came out of the willows…even though the light was beginning to fade many students still got some nice shots of this magnificent specimen as he patrolled the lowlands looking for his competition and securing his right as the dominant male in the area. What a way to end day 1! With everyone's adrenaline still pumping we ended our first day with a group dinner at a local Jackson steak house where everyone continued the photography talk and no doubt recapped how excited they were when the moose charged. Day 2 began slightly later than the first as we set up shop on the famous Mormon row to capture sunrise of the Moulton Barn in front of the mighty Teton Range. 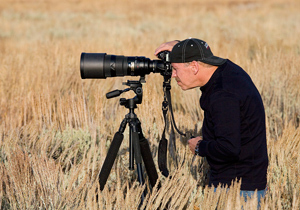 This location is not only one of the most iconic in the park, it's also one of the best locations to demonstrate the concept of telephoto compression. 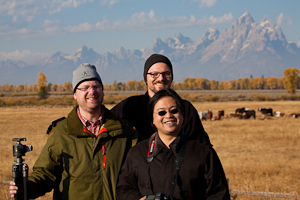 The concept deals with using a zoom lens to reduce the appearance of distance between the foreground subject (the barn) and the background (The Tetons) the result is an image where the Tetons appear to loom dramatically over the barn. The light was beautiful on this spot, and at the last minute a herd of bison moved into the scene and made the whole shot that much more iconic and exciting. It literally had every good element needed to be a winner. The class loved the spot! 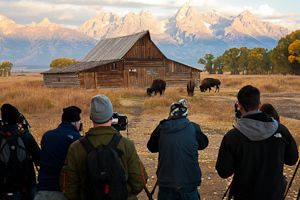 Not only did we get some great iconic photographs of the barn and mountains, but we got a chance to capture some great wildlife shots of the bison herd as well. We left excited for more! 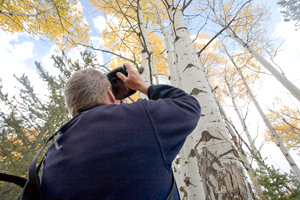 It was time for more scouting for wildlife. We started with the areas we had seen the moose the night before. While the river area didn't yield any moose that were visible for photography, we noticed a large amount of cars parked alongside the road. We stopped and could easily see a large bull moose was laying in the fields near where we had seen the antelope the previous night. This looked like the perfect opportunity to capture some great unobstructed views of this HUGE bull. 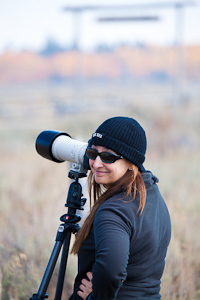 It also helped demonstrate perhaps the biggest and most difficult rule of wildlife photography….patience! We set up for the shot. 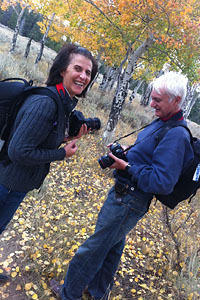 The instructors helped lend ideas for composition and dial the students in on the proper settings. The only thing we needed was the moose to stand up! Big animals like the moose spend a lot of time doing one of two things; sleeping and eating. We covered the moose for nearly 2 hours waiting for the 5 minutes when he was actually standing up. 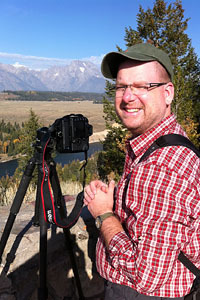 Those times he did the class got some tremendous images, many of which were full frame shots of the moose, or great environmental images of the moose with the Tetons looming in the rear. When the moose finished his second standing session and gone back down we took the opportunity to get our own rest in and headed back to Jackson Hole for an afternoon break. The evening we began back at the overlook of the Oxbow Bend where the students shot some of the peaking fall colors along the river. 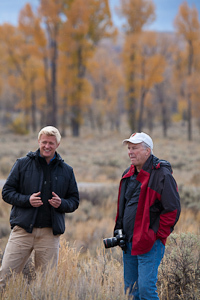 The clouds and the Tetons were great balancers for the vibrant oranges, yellows, and reds of the foliage. 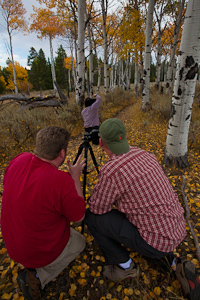 Brian took a few students down to the trees to work on closer more intimate detail shots of the colors and trees. Our ability to work with students one on one an in smaller groups allows us to really focus on helping the students get the types of images they came to capture. 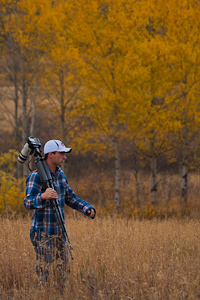 When the class had captured some great fall color images, we loaded back up into the van to try and finish the day and workshop with some more wildlife images and see some of the critters we hadn't seen yet…namely bear. We drove the popular areas for the mammals and finally came across what we'd been searching for….our first bear! We noticed the bear because of the bear jam, a fancy name for the scene when a bear is spotted and every visitor in the park stops to see it. Then rangers had already arrived on scene to ensure that the crowd stayed a good distance from the bear, and that the black bear was allowed to eat his berries without fear of his dinner being taken from him. 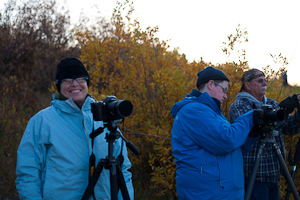 Our instructors moved the class to the best spots in the group to capture images of this large bear in the tree trying to break the record for most berries consumed in a 2 hour period. The rangers were GREAT at allowing the class to stay within good view of the bear so that we could all get nice shots of the bear as he munched his way to obesity for the approaching winter. The bear moved branches around and gorged on berries, all the while the class snapped away like paparazzi every time he glanced their way. Those who were among the crowd not interested in photographing the bear were interested in watching in hopes he gorged to the point of tipping the scales and snapping the branch of the bush he had crawled out on to get the berries. Eventually the bear tired of his berries and decided he was ready to cross the road. The ranger alerted the crowd to his direction and intentions and he waddled out from the trees, across the road, and off to find more food in other parts of the park. It was exciting to be sure as some folks were within 20-30 feet of the bear! A second night and another adrenaline rush to end it! The class returned to Jackson still on a rush from the whole weekend. 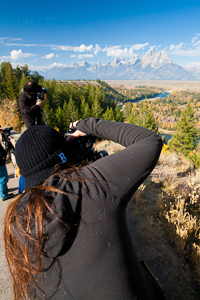 We'd seen iconic landscape locations as well as some of the iconic wildlife indigenous to Teton National Park. 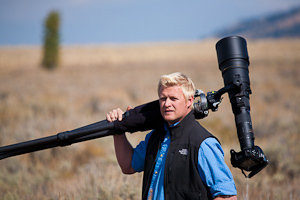 It was a weekend full of great images. The instructors were very impressed with the continuous enthusiasm from the students throughout the long weekend, and the images they saw on the view screens of the student cameras were stunning! The class came away with some dynamite images for sure! The only thing left to do was return home and process them….which may require more patience than waiting for a moose to stand up. 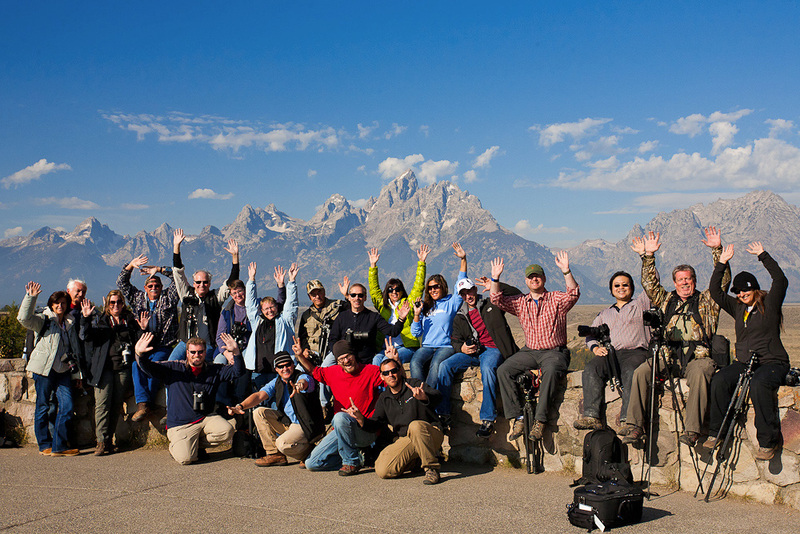 Morning came and the group loaded up the ApCab, our luxury photography cruiser, and set off for the North Side of Mt grand-teton to photograph the sunrise. The North side of the mountain is a beautiful location full of old juniper trees, bunches of wild flowers, and a spectacular view of the snow covered mountain rising over 14,000 feet into the atmosphere. The good clouds were to behind us, which gave the class a chance to photograph the mountain as well as a very colorful sunrise to the north with the fields of trees and distant mountain ridges. 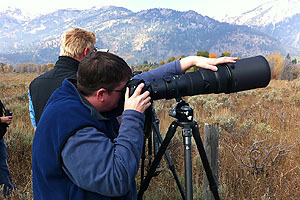 While the class worked on photographing grand-teton, Brian, Scott, and Kelly helped students with the various settings and figuring out the best compositions to capture the mountain at it's best. 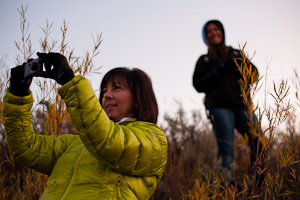 Whether it was a bunch of bright yellow flowers, or an old set of juniper roots, the area had a large array of items to be used for the foreground to make a balanced, and aesthetically pleasing image. 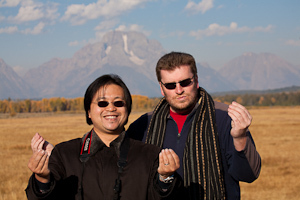 Stephen, Scott, Brian, Scott and the rest of Aperture Academy team!